The final piece of the derelict barge Davy Crockett will be pulled out of the Columbia River this week, the U.S. Coast Guard announced Monday. The last section of the 431-foot vessel will come out Thursday, almost seven months after it partially sank on the north bank of the river near Camas. The converted liberty ship sank after its owner attempted to scrap the vessel while it was still afloat. 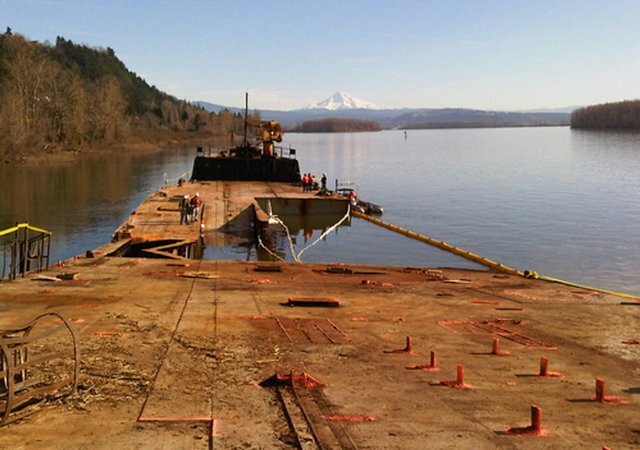 Instead, the barge buckled and sank, releasing oil and debris into the Columbia River. A massive cleanup effort, coordinated by the Coast Guard, Washington State Department of Ecology and the Oregon Department of Environmental Quality, followed. Crews have systematically dismantled the vessel piece by piece where it sits in the river. Workers built a cofferdam barrier around the site to prevent further pollution. The effort has cost $19.2 million to date, according to the state Department of Ecology. The cleanup won't be finished when the boat is gone. Divers will also dredge the river bottom inside the work site, removing contamination before the barrier is removed. That process could take several more weeks, according to the Coast Guard.